Hello and happy Saturday! I'm so excited to be starting off the new year as a DT member for one of my favourite challenges Less is More. LIM is one of the first challenges I entered shortly after starting my blog back in March of 2017. Our first challenge for 2019 is "Water" and you can interpret this in anyway you like, as long as your card is CAS. Just remember, we like to see all that beautiful "white space" on your card. 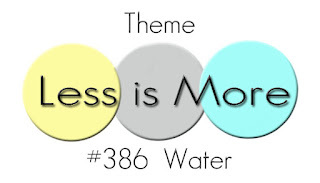 Click HERE to take you over to the Less is More Challenge blog for a ton of inspiration! 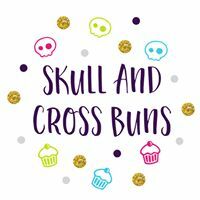 Our sponsor this month is Skull and Cross Buns, they have some cute stamps and you can check their website out HERE. For my first card I used the smooshing technique by adding Distress inks to a piece of acetate, spritzed it with water and smooshed onto a piece of Bristol card stock. I dried the ink before adding another colour. I used three different colours of Distress Inks starting with the lightest colour. I stamped the butterfly and sentiment from Clearly Besotted in CP Midnight ink. For my second card I masked an area on my card front with painters tape and used the same smooshing technique but this time with some watercolour markers instead of Distress inks. I stamped the floral image from Uniko over the top with CP Midnight ink and added a sentiment from CAS-ual Fridays. I am also entering this card into the Watercooler Wednesday Challenge which is Dawn's Feminine "Anything Goes". These cards are both gorgeous, Michelle. I love the very different results that you achieved from the same technique. The colors are brilliant. I am so pleased to start this new adventure with you and all of the designers on the LIM team. Looking forward to lots of fun and creativity together! Congrats on your new DT position Michelle. Lovely pair of cards - I love a bit of ink smooshing! Congratulations on your DT x. Glorious CAS cards, both of them. Love the vibrancy of the blues and the black stamping looks wonderful. Unique and beautiful cards and thank you for the inspiration x.
Congratulations on joining the DT, Michelle! You have created 2 beautiful CAS cards! I love the gorgeous colours you have used and the clever designs! Thanks so much for joining us at Watercooler Wednesday Challenge this week! So sorry I'm so late visiting, Michelle!